I am a 38 year old mother of two who grew up in Washington Heights with her fellow Dominicans and now resides in Staten Island. I direct an after school program and summer camp for a non profit organization by day but all of my free spaces are occupied by writing. It’s my greatest passion. At what age do you began writing? There’s was a particular incident that made you want to write? I was never a fan of spending summers at home all day and often elected to take extra classes in summer school while in HS. One particular summer there was a writing workshop being offered and I thought it would be fun to attend. I still remember the first poem I ever wrote in that class. At the time I was afraid I was with child and was having horrific nightmares about undergoing an abortion. It came out on paper, and it turned out I wasn’t pregnant, which was great! Lol. In college I slammed often at the Nuyorican and was invited to join their team in summer of 1998. We competed in the Love Jones festival in ft. Lauderdale and won! I fell in love with the release of emotion writing allowed and I haven’t stopped since. Who are you favorite writers? I am a huge fan of Marquez, Neruda, Nikki Giovanni, Toni Morrison, Zora Neal Hurston and Saul Williams to name a few. What are your writing process, rituals, and routines? I tend to jot down ideas as they come. Some I develop into full blown spoken word pieces, others remain single stanza pieces that have the strength to stand alone. I use writing prompts to get the juices flowing at times and love participating in prompt challenges on instagram lol. I wake up half an hour early and write down the first thing that comes to mind. It can be a new thought or the continuation of a previously started project. The point for me is to write daily and often to keep my pen flowing. Which topics are frequent in your writing? What genre do you prefer? I write about life and everything that encompasses. The easiest thing to ever write about is love- who hasn’t been affected by it really? Lol. I enjoy challenging myself and writing outside that comfort zone to talk about things like identity and race for example. My first love will always be spoken word- I refer to it as poetry in 3D. What is your favorite thing you have created? That is a tough question! Lol. I always feel like I haven’t written my favorite piece yet but I do have a couple that I refer to ever so often. If I had to choose though I would say it is a poem entitled “No Inbetween.” It is the first piece I wrote that had nothing to do with love and relationships, it’s a nod to my Dominican heritage and speaks to the awkwardness of trying to fit into societies boxes and retain your identity. I absolutely do. I have always tapped into the right half of my brain. I enjoy drawing, interior decorating and also have a passion for event design. I’m honestly just trying to quiet the noise in my head. If I don’t write I feel heavy and burdened. If someone happens to relate to what I write it is a huge plus. 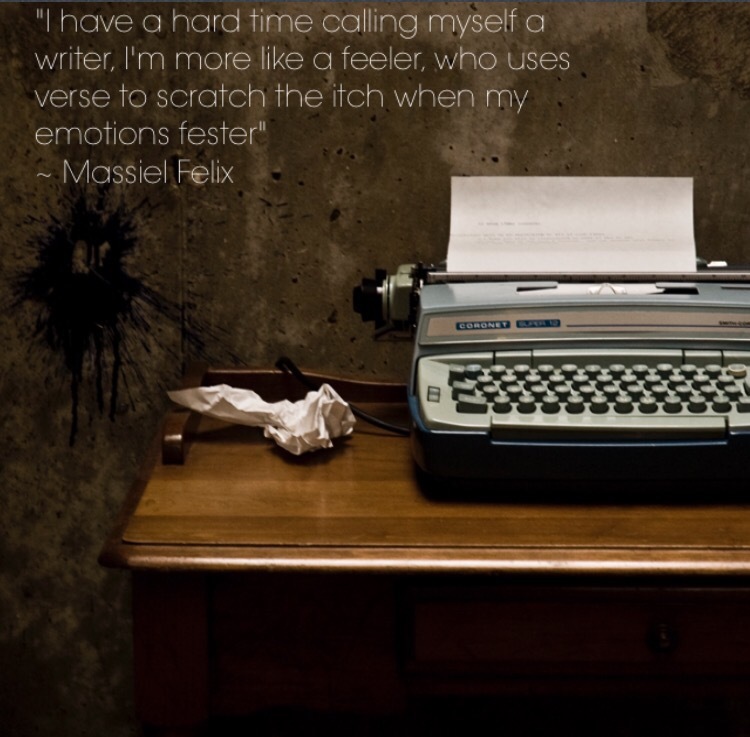 What type of difficulties have you faced when it comes to pursuing your writing career? How have you dismissed these obstacles? I have just recently devoted myself to making a career out of my art so there hasn’t been much time to come across obstacles. I am my own worst critic though so I can see that being the greatest obstacle I will have to overcome in the long run. My hope is that with continued growth I will outgrow the fear of inadequacy and failure I harbor and push through to success. How do we see Massiel in the future? What are your plans? How can we find more of your work? Any advice for new writers? 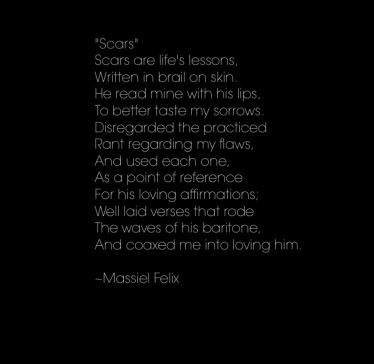 I see Massiel as a published poet in about a year or so. I am currently working on growing my contingent of supporters on the Instagram page I have devoted to my art : @ihavepoetry and also working with fellow poets to put together and participate in showcases throughout the city. My biggest piece of advice would be to trust your voice, it is like no other and that’s what makes it special. Read read read! Anything you can get your hands on to grow your vocabulary and expand your minds horizons – then let it out on paper. Make time to write daily- schedule it in like you would a meal! Lol. Washington Heights, Where is Tío? Great post! I gained some new knowledge to drive myself forward. Thank you so much for reading. I glad you found this interview helpful. Much success to you! ❤ I enjoyed reading this interview and I would love to see Massiel Felix perform at a spoken word event!